Torso pitch: -25° to +40° while standing. -25° to +50° while crouching. The Madcat MKII is a well-armored Clan Assault Mech with Jump Jets. The MKII has a limited field of view - the large cockpit will partially obstruct your aim when looking down. Combined with the MKII's low max torso twist angle, it can be very vulnerable to Battle Armor. The MkII is among the fastest Assault Mechs on the field, boasting a top speed of 64 kph, and the only Assault Class Mech in-game with Jump Jets, which provide it surprising maneuverability for its size and firepower. Its armor, while tough, is insufficient for extended brawling. The Mad Cat MkII Prime is one of the most versatile and deadly Assault Mechs available to the Clans. Its Primary weapons are a pair of CGauss, able to strike out to 900 meters with precision and devastating firepower. Backing up this lethal pair are two CLRM10, solidifying this Mech as a long-range skirmishing tool. It is, however, also fitted with two CERMBL and two CERSBL, giving it teeth for close range and some capability once out of ammo. Take advantage of this variant's speed and Jump Jets to strike from unexpected directions, and keep your foes at arms reach if possible. When facing one, it is likely to be in a sniping position far from the front, so sneaking up on one is the most successful strategy. Its primary firepower is in the arms, so if in doubt, remove its guns! Unlike the Canon variant, it also packs 2 spare tons of ammo to provide some endurance on the field. The famous "Beat Stick" is one of best close-range units available. Mounting, among other weapons, a pair of CLBX20s, it has enough firepower to heavily damage nearly any unit below 300 meters in a single salvo. In addition to these two massive guns, the A variant also mounts four ER Small Beam Lasers, and two HE ATM-6s. All weapons combined, the MkII A variant is capable of unleashing crippling damage. 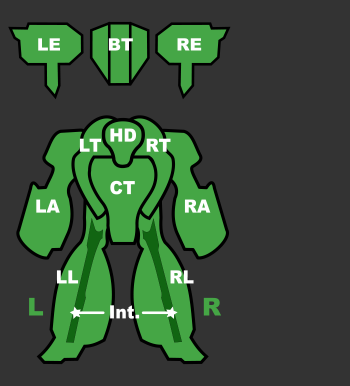 However, this Mech is slower than most Mechs of lower weight, which makes closing with a target a difficult task. It's also not equipped with any electronic equipment, nor does it allow for additional ammunition, making the A variant highly dependent on teammates for both target information and ammunition. The inclusion of Improved Jump Jets, however, significantly enhances mobility, especially in urban environments. An alternative brawler to the "Beat Stick", though more directed towards stunning the opponent than quickly damaging it. Two Dual SSRM6 launchers make a powerful punch, severely limiting the accuracy of a target's return fire, especially when the Dual SSRM-6s are stagger-fired. To make matters worse for that target, the MkII B mounts two highly destructive cUAC20, which inflict the majority of the damage to the target. Improved Jump Jets make this variant a highly maneuverable beast, and two extra tons of ammo provide some battlefield endurance. The only significant cons of this model are its severe range, electronics limitations, and the removal of 1.5 tons of armor - making it the least well-armored MkII variant, and therefore a considerably softer target. Loosing 1200 armor from center torso and 600 from sides is realy felt in the heat of a battle, but loosing 500 armor on arms, where its maid weapons are, could make B armless in no time. B-Pod provides some leeway when dealing with enemy Battle Armor. The C variant is geared towards long- and extreme-range fire support, equipped with two CERLLs and two ArrowIV Missile launchers. It is capable of dealing high damage at very long ranges and is also equipped with Jump Jets, which allow it some mobility and enable the use of poptarting tactics. Four Machine Guns provide some protection from Battle Armor or etching away at armor. Four extra tons allow this variant to maintain considerable ammo-independence. The MkII C's most glaring weakness, however, is that its main weapons generate a lot of heat and have long refire rates, making it highly ill-suited for short- to medium-range engagements. In addition to this, the MkII C cannot deal Alpha Strikes, at least not without inflicting significant damage to itself. When attacking a MkII C, it is well-advised to stay at range while moving behind cover, and then sneaking up to engage it at close range where it is nearly incapable of defending itself. A medium- to long-range brawler and support 'Mech, the D variant of the MKII trades out the pair of Gauss Rifles for a pair of Clan ER Large Lasers, somewhat lessening the Mech's ammo-dependence. Though the two ER Large Lasers are excellent for long-range poking, the main firepower of this variant comes from two Standard ATM12s, which are most effective at medium or intermediate range. Feeding these two rather ammo-hungry missile systems are an extra 2 tons of ammunition, giving the MkII D a little more battlefield endurance. A pair of ER Medium Lasers rounds out this variant's armament, and provides some extra damage for when enemies get under the ATMs' minimum range. Watch its heat output though! Known as the "Siege Engine," this behemoth can inflict heavy damage from around 800 meters. The four CUAC5s can pick apart any component a pilot sets their eyes on. A pair of ATM9s provides considerable damage at intermediate and medium ranges. However, the minimum range of these systems should be noted as anything inside that range will reduce this variant's maximum effectiveness. For enemies that close this range, four Machine Guns offer protection from Battle Armor, along with its B-Pod, or to finish off your opponent, putting them out of their misery. Though the lack of Jump Jets means the MkII E is not nearly as mobile as most other MkII variants, its four tons of extra ammunition allow it significant battlefield endurance. A rather odd variant for a MkII base, the MkII F carries a wide array of weaponry, and is the only variant to mount any specialized electronics equipment. 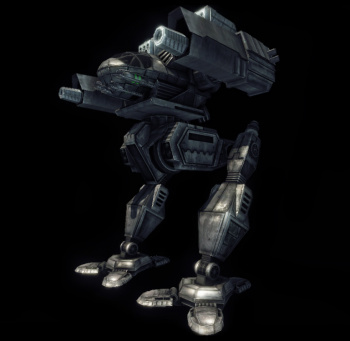 This equipment is the GECM, which allows the Mech to engage in long- to medium-range attacks without being easily noticed. C3 for distributing key information to teammates in range. EOptics for precision and long-distance aiming. At 1250m lock on to your victim, release a barrage of missiles to rain down on them. As they cross into 900 meter range open up with two CERPPC and at anytime let loose the four MG,s. Twelve DHS for heat dissipation, Two Free tons supply the ATM9(ER) and 1 extra ton of Armor for staying power. Don't be bashful about letting your opponent know who's in charge. Geared for long-range strikes, the MkII G can be a heavy hitter when its guns come into play. These guns include a twin Hyper-Assault Gauss 20, and a pair of Clan LRM10s. The twin HAG20s are especially lethal when used in precision strikes, as the combination can easily shred through individual components on most light and medium assets. The two LRM10s offer long-range striking power, and can even be used in brawling at closer ranges due to the Clan LRMs having almost no minimum range. The inclusion of Jump Jets and an 4 extra tons for ammunition - idealy for the HAG20 - offer this variant some degree of maneuverability and endurance. Despite the high amounts of damage the MkII G can dish out at long range, its greatest weakness is the insufficient amount of DHS when G gets into a brawl, since 2 cHMLs and 2 cHSLs generates a lot of heat. The Mad Cat Mk II was in development for fifteen months by the time production began in 3061. The sole rationale for the Mad Cat Mk II was to increase profits for Clan Diamond Shark after war with the Inner Sphere in the 3050s. Designed to be sold to fellow Clans - and later sold to the Inner Sphere - this rebuild of the iconic Timber Wolf OmniMech carries thirteen tons of Ferro-Fibrous armor while being one of most nimble BattleMechs of its class, and still packs serious weaponry. The standard variant sports two Gauss Rifles and two LRM10s, which make for devastating long-range assaults, while four ER Medium Lasers provide adequate support at medium to short ranges. Other variants range from simple, unified long-range configurations, to more radical intermediate range monstrosities. On a limited basis, Clan Diamond Shark sold unmodified Mad Cat Mk IIs to a few Inner Sphere factions - most notably the Draconis Combine and Federated Commonwealth, and the Lyran Alliance would also buy an unknown amount.